Back in 2000, cinemagoers were thankful to director Ridley Scott for bringing back a genre which seemed long-forgotten. This is the historical epic, which includes movies like Spartacus and The Fall of the Roman Empire, movies which audiences used to enjoy in the past. 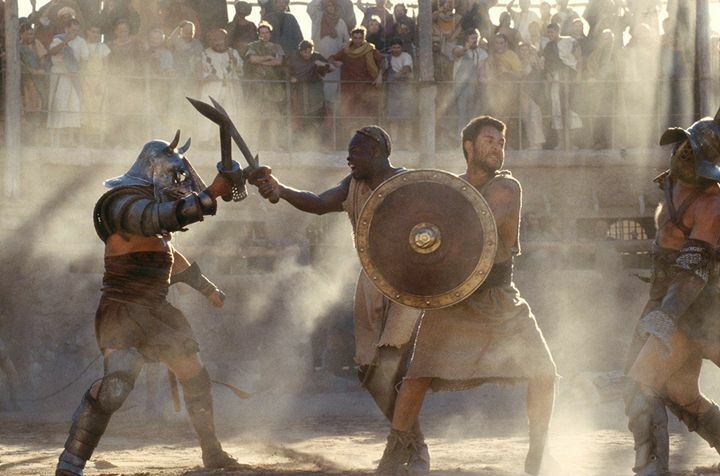 And although more recent movies such as 2004’s Troy tried to recapture the glory of past classics, it was Ridley Scott’s film which truly gave audiences the epic they were lusting for. This is because Gladiator not only featured enormous battles between Roman soldiers and barbarians, but also gladiatorial combat to the death in the largest Roman arena of all, the Colosseum. The movie was also helped by a powerful performance by Russell Crowe, a generally unlikeable actor which still managed to deliver an Academy Award-winning performance in Scott’s movie. Here he played Maximus, a Roman general wanting to get even with the evil emperor Commodus played by Joaquin Phoenix, arguably the best character in the movie. Add to this a great supporting cast including Oliver Reed as a slave trader, and Djimon Hounsou as Maximus’ gladiator sidekick, and this was certainly a movie to remember. The movie was also rapturously received by film critics, and ended up bagging 5 Academy Awards too (Ridley Scott did not pick up the best director award though). And fans of Ridley Scott’s movie will be happy to hear that a sequel to Gladiator could be in the works, as was recently reported on movie website Deadline (via GameSpot). Thankfully though, those who are not fans of Russell Crowe (and I count myself in this group) won’t have to see the Australian actor in another Gladiator movie, as he bought the farm at the end of the 2000 movie. Rather, Gladiator 2 (if this ends up being the movie’s name) will focus on the character of Lucius, who was emperor Commodus’ nephew in the first film. Other details about the movie include the fact that author Peter Craig will be taking care of writing duties in this Gladiator sequel according to Deadline. The man has written two of the Hunger Games movies and is also working on the upcoming Top Gun: Maverick, although it remains to be seen whether he can deliver the kind of script that a Gladiator sequel will need. Also, it seems Paramount rather than Dreamworks will be the main studio behind Gladiator 2, while it’s clear this film could still take a while to hit theatres as Ridley Scott is currently at work on a TV series, while the English director also has another movie starring Scarlett Johansson and a film about wizard Merlin for Disney in the pipeline. But if a Gladiator sequel does materialize it would be a great thing for fans of the original movie if this turns out to be a great action epic as 2000’s Gladiator was when it lands on theatres at a future date.